The Press is milking the death of Zarqawi for all that it's worth. The fact is that although sending somewhat of a blow to the insurgents, Zarqawi led only around 11% of the insurgents. Another fact is that the raid was conducted by Americans, not Iraqi's. The war is definitely still far from over. I expect the president to milk this as much as he can. With all this debate over immigration, it really seems that we are overlooking the root cause of this entire problem: Mexico's economy. No where in these debates has any senator or otherwise discussed how we should deal with Mexico's floundering economy. One of Mexico's main issues is corruption, more specifically in the tax collection arena. A government rampant with corruption is not very suitable for investment or production. As my economics professor suggested, if we were to focus more of this debate on creating a production model within Mexico, it would eliminate some of the desire for Mexicans to cross the border. According to a recent study, 1 in 4 mexicans would cross the border if there were no safety hazards associated with it. Why are we focusing our agenda on creating a three layered fence instead of looking at the bigger picture ? It astounds me that we are even considering a fence as a viable solution to this problem. Do we not remember how easily the Maginot line was avoided during WWII ? I'm sure these immigrants have heard of wire cutters. Mexico has struggled for a century to find its identity. We have attempted to help in the past and I think its time for us to step in again. Creating a production model in the country would benefit us as well, for transportation would be cheaper than shipping from China. We would also be spending less on keeping people out of our country as more would want want to stay in. The fact of the matter is that many Mexicans come for our labor but reinvest a lot of the money back into their families in Mexico, or end up moving back altogether. Solving these problems could be a catalyst for a change, and must be taken seriously. Hu Jintao, President of China, spent the past couple days visiting our great state of Washington. He ended his night last night at the home of the world's richest man, Mr. Bill Gates. Their was a great article in the Seattle Times discussing how much influence Bill has across the world, and how his home has become somewhat of a Western White House for traveling somebody's from Asia. One of the most interesting things I noted from the article was that Mr. Jintao was trained as an engineer. Coincidentally, I am studying China's view on globalization and read one of Jintao's speeches a couple days ago. His speech, although translated, was well versed, well thought out, and intelligent. It got me thinking, what if our country was run by an engineer versus our usual blend of lawyers and Bushes. I'll be posting my paper on China and globalization, and from what I what I can tell, it seems clear that having such a capable leader is a great thing indeed (human rights abuses aside). How does an Empire stay together? Like a corporation, a country that expands and develops rapidly, will eventually contract. Empires much larger than ours have been beaten down at the hands of father time, and a breakdown in the structure that seems inevitable for any empire. It is important for us to examine and learn from the mistakes of our imperious brethren. I worry that our country is becoming more like our ex enemies, the Soviet Union. This administration guides us more towards a militaristic state each year. So how has the UK done it? France? I would argue that a strong central and centrist government and military is very important. Strong diplomacy and allies also seems to help. The centered government seems too crucial. Our policies have been over characteristically right leaning while France's are way out to the left, which is no good for anyone. Researching the British Empire, the stretch of their empire is amazing. It was once referred to as the empire in which the sun never set because of its vast size. The British seem to have been experts at taking over and setting up their territories for self governance. These territories became Australia, Canada and the now blossoming India. So why are we having so much trouble in Iraq ? My theory is in our approach and the region. If you take a look at the British Empire, aside from India, they were unable to successfully conquer any part of the Middle East. England's approach has also been typically progressive, while we are much more conservative in terms of government and projection across the world. If you take the example of slavery, the British Empire abolished slavery in 1808. It took us more than a half decade and a civil war to catch up. While we are hated by the Middle East, you don't hear much complaint from current or former British colonies, even though some, such as Nigeria, have weathered an incredibly rough time. Although Iraq is not officially an American colony, it is clearly suffering without our intervention. We have set up a few million dollars worth of new equipment such as treatment plants, but they are not being used because the roads are so dangerous. As soon as we let the Iraqi's "control" their own fate, actions and talk immediately took an air of civil war. There is no easy solution to Iraq, but perhaps looking to imperialists past will help. I found this great set on Flickr, depicting the ongoing youth riots in France. I previously blogged about the situation here, but hadn't realized the scope of the problem until viewing this set. The page also details events that have occured within in the past month, all in all it's very frightening, and breathtaking.. Here's a sneak peak. My fellow french young men and women are marching upon France by the millions. The problem: unemployment. So Dominique De Villepin, France's prime minister decided to try to help the youth by imposing lower amounts of requirements on employers who hire first time job seekers. This of course meant that french kids were no longer guaranteed a position for life, since employers could more easily fire them. So what does the youth do ? They rebel and protest. The mindset of the French in general is so much different from the work horse culture of America that's a little hard to visualize. French people are so used to having everything provided for by the government, that when the government performs any attempt to switch the economy to a more capitalist friendly mode, the people whine and protest. I can't even remember the number of protests that I've heard from labor unions, young adults and various others. If France wants to remain competitive, they must change there mindset. Especially the youth, as they control the future of France's hang by a thread economy. The United States military put together a not so great marketing move over the past week: Operation Swarmer. 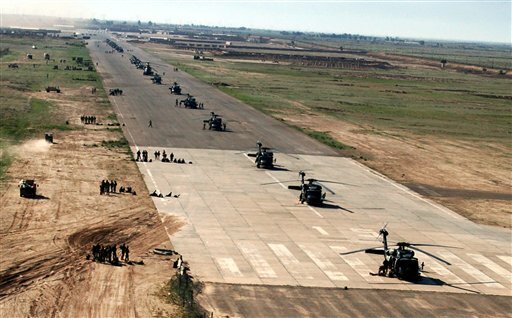 It was touted as the biggest helicopter military operation in three years, mobilizing over 1,500 troops. However, as I learned from NPR, no fighting occured. That's right, we moved 15 hundred people for... well just about nothing. Big media was all over the story, which further leads me to believe this was a move by the Bush adminstration to yet again sway the public from bigger issues, and more importantly, ever lower ratings for the president. It doesn't seem the American public has been swayed by the story, and it seems they are going to have to try harder to get us listening again. I just wonder the amounts of money that were spent over the last week for this "operation". Watching Representative Tom Lantos comparing the Internet's Big 4 (Microsoft, Google, Yahoo and Cisco) to Nazi Germany, I was a little taken aback. I don't agree that censorship and all is a good idea, however, avoiding doing business in China altogether is a much worse idea. For better or for worse, China has their own way of wanting to handle things and if we are to interfere. If politicians care dearly about it, they should go about it through avenues then scolding American companies for complying with the rules of that country. My find it hard to believe that China would allow internet businesses to continue doing business in China without censorship. I also think its just plain stupid for the United States not to allow them to do so, because if that ends up being the case, China will develop their own Yahoo's and Google, shutting the U.S. completely out of the most important deveoping market in the near future. The funniest part about all this is, the Chinese actually make a pretty good case for themselves.